Under the leadership of former Dakar winner and ex-director Hubert Auriol Dakar is the China Grand Rally, renamed a few weeks ago to CHINA SILK ROAD RALLY 2015. China's long-distance marathon off-road rally is a large-scale international long distance rally which was held in 2013 for the first time. It is the second largest rally raid in the world with your 6,000 kilometers in 12 stages spread over five provinces of China Shaanxi, Ningxia, Inner Mongolia, Gansu and Xinjiang. The starting flag falls on August 30 in Xi'an Daming Palace before Xi'An (500 kilometers from Beijing removed). Then it goes to the west. With a total of 3000 km special stage the Rallye Raid includes everything that makes a big rally: dunes, sand, high-speed sections, technical sections and tricky navigation. Also in 2015 CCTV group will broadcast the event with great media presence in China and around the world. The CCTV group, has more than one billion viewers (95.6% of the population). 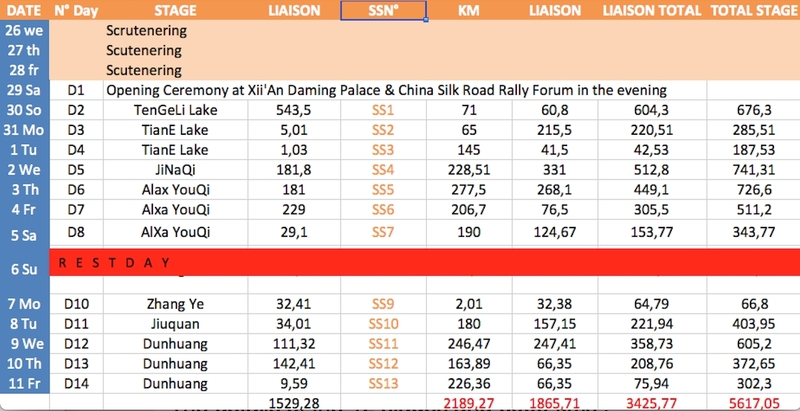 CGR China Silk Road Rally and CCTV group is currently conducting negotiations with European television channels to broadcast a daily report in Europe during the next 2015 CGR China Silk Road Rally. Further information will be available soon. The finish line is September 12 in Dunhuang.